Ever wondered what happens in the radio therapy room? Are you looking at radiation and chemotherapy for a brain tumour? Here’s a terrific video taken by my husband of me getting set up for a treatment, featuring a couple of the terrific radiation technicians I see every day. Excellent people, doing excellent difficult work, making me feel like much more than just another patient, every day. This was taken four weeks into six weeks of radiation therapy, paired with daily chemotherapy, which started a month after my awake craniotomy. 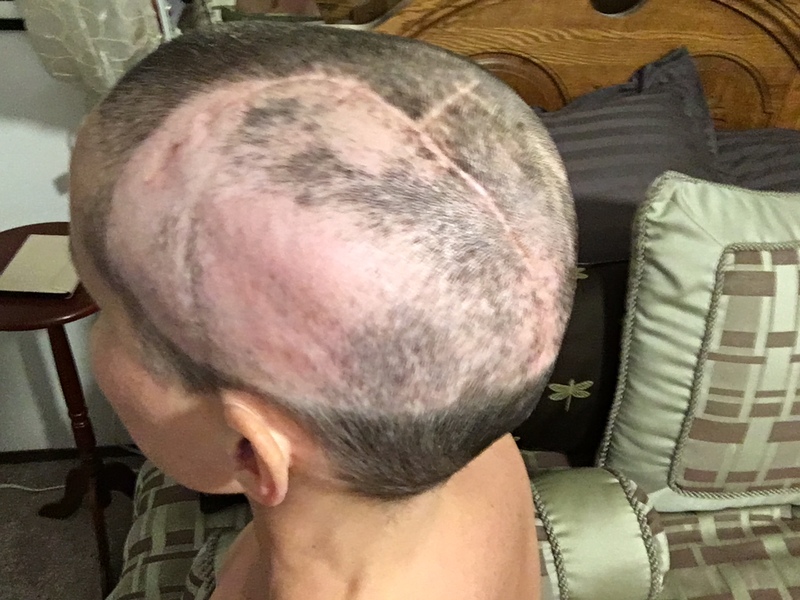 I started feeling the expected side effects of radiation therapy around week three, combined with the side effects of the steroid medication that keeps my brain from swelling due to the radiation. After this video, the technicians and my husband will exit the room, an X-Ray will be taken of my head to ensure accurate alignment, then about two minutes of radiation is applied to four spots around my head. The idea is to have the radiation enter through the healthy brain tissue in a diffuse manner, then focus at the point of the tumour cells that remain after surgery. Think like a prism focuses light. You can see where the beams enter, mainly on the left/rear of my head, by the balding patches! I feel nothing during the actual treatment, and get sleepy only a few hours later. The two areas I’ve not really had any side effects at all are immune system and gastro/gut effects, I thank my nutrition and gut health advisors for that, and credit my sticking to a strong keto diet for energy and help with immune, gut and brain fog help! I’m looking at five more days of treatment now, then looking forward to a few weeks break and recovery and weaning off of the steroid medication (which is hateful!!!). On the upside, I expect some nice high blood ketone measurements as I hopefully shed the weight gained! Good luck. Get well soon. Sending warm wishes your way. Just curious…have your doctors (and nurses, radiation techs, etc) expressed any interest in learning more about the ketogenic approach, since you seem to be faring much better than the average patient? Of course, I recognize we can’t attribute *everything* to the ketogenic side of things…obviously, you’ve had a tremendous amount of support from family and your medical team, and you have an incredible fighting spirit and positive attitude. 🙂 But I do think the diet probably had a powerful effect as well, so I was wondering if anyone has wanted to learn more about it after seeing how well you’ve come through things so far. I agree, and yes, I have seen more interest and support for the diet and learning about its benefits than I saw two or three years ago. Most of the folks are just interested in what is helping me cope, and comment on how many of the common side effects seem to be missing, so they definitely want to know more. Opportunities to spread the word, for sure. I am in awe of your strength! Thank you for sharing & giving hope! There are many natural cures out there. I deeply admire Dr. Nick Gonzalez, (Columbia, Cornell/Sloan Kettering. They even asked him to join their “prestigious” group. 2 times he said no. He has been curing people of pancreatic cancer for 30 yrs, even those whose cancers have metastcized to other places and were give a few weeks to a few months to live and 30 yrs later they are still alive. His practice was in NTY (sadly he died last June under suspicious circumstances) But I think the other doc continues, Dr. Linda Issacs. You can help make cancer uncomfortable;e by getting O2 into your cells. Cancer does not like O2. cell will break will break apart. You can now buy liquid O2 on Amazon. I would think more about diet than chemo. Go to youtube where you will find some of the interviews from the Quest for the Cure. He traveled all over the world and intervieed scientist, Doc, cancer survivors. a;; of whom were cured via natural means. Get out a strong blender or juices and start eating raw foot, no processed food, juicing raw veggies, lots of water and good supplements. Vit D and real Vit c (not ascorbic acid) You can see a great interview w Dr. Gonzalez on youtube w SANITAS radio. It’s the one w the pic of the Dr. G w food in the background. Concentrate on food. Chemo is derived from nerve gas. When NiXon used the term WAR ON CANCER. Why is everything thought in terms of WAR. Do we go to WAR against out now bodies? What ever you decide to do. I wish you well. But if you are not well enough have someone research natural cures. They are out there. I should have said “Are” Alix! P.S. I am a vegetarian and doubt I can pull of attempting this ketogenic thing… Would love to ask you a million questions about life stuff. P.S.S. Wasn’t an awake craniotomy fascinating?!? At one point the doctor probed me (while I watched a screen in front of my face showing it (which didn’t bother me until about 2 hours in) and it effected my hand. He asked if he should remove the section of the tumor as it might effect my ability to use my right (and dominant) hand. IN THE MIDDLE OF SURGERY I had to make the decision. I said go for it and all has been fine. INCREDIBLE experience. Hi, Katie, I will definitely shoot you an email and check out your blog, wow, it’s amazing how similar our experiences have been! In the four years since I was originally diagnosed, I’ve found that’s rare. I had no idea there were so many different types of brain tumors before I had one. Your quick outline of your experience is exactly like mine, same tumour type, everything, except in Aug 2012 when they found mine, the pathology results were reversed – the first opinion said there were grade III characteristics, and the second opinion said no, but monitor closely. So that’s why we were recommended watchful waiting until an MRI showed it had grown. Thanks for reading and commenting, we’ll talk much more I’m sure! Best wishes with the remaining treatments you have left to go! Hey Alix, have you heard of or tried 3-BP which was developed at Johns Hopkins. It works in theory like the ketogenic diet in that it inhibits the cancer cell from absorbing glucose and it inhibits the 2 avenues by which the cancer cell generates energy. There is much more to it but it seems to exhibit much promise. I understand that Dayspring Cancer Clinic of Scottsdale, Arizona uses it. A Dr. Young Ko of Johns Hopkins had been delevoping it. It worked fantastically well in the animal studies and has been used on some people as well. Dr. Mercola also had a recent article on it in his newsletter a few days ago. It seems very promising. It has been wonderful and inspiring to read your blog. I have written books on gardening, diet, exercise etc — and what I tell people about diet and exercise is that it is a game of odds, not guarantees. I have done a ketogenic diet before and it was no picnic — especially the first couple of weeks. For you to stick to that for years shows incredible strength of will. I think the way your blog teaches people to be critical and also assertive and ask questions is really important. And I also think the way you approach ketogenic diet as adjunct to rather than replacement for modern medicine is mature and responsible. Sometimes natural medicine proponents forget that if natural medicine worked so fabulously and reliably, modern medicine would not exist. It definitely has its place, but is far from perfect. I admire your courage and have enjoyed reading your blog! Thank you very much and thanks for reading. I found your site in my journey of learning more on a keto diet, and see you haven’t posted anything for a while. Praying you are doing well and recovering as it sounds like 2015 ended with a lot of stuff on your plate physically. Hugs and prayers sent from Oregon! Hi, Renae, thanks for reading. I am doing fine, still having oral chemo. I am a thinker; I write after I think things over, so, being in the middle of it all, I’ve been quiet. I’ll be back! I too, admire your strength. I could never do it. Many people have cured themselves w simple baking soda as it changes the ph to alkaline which canncer does not like. Have you thought about doing this/ It’s easy and simples. A man has a site called. phkillscancer.com He had stage 4 rotate cancer and cured himself w baking soda and black strap molasses. Try and eat healthy. Living fuel is good and also Life one. Essay tea can also help. I think cancer crackdown.org, a charity sells it.